The likeness is unmistakable— That pose. That expression. That haircut. That weaponry. THAT is Conan the Barbarian—and we all know it. 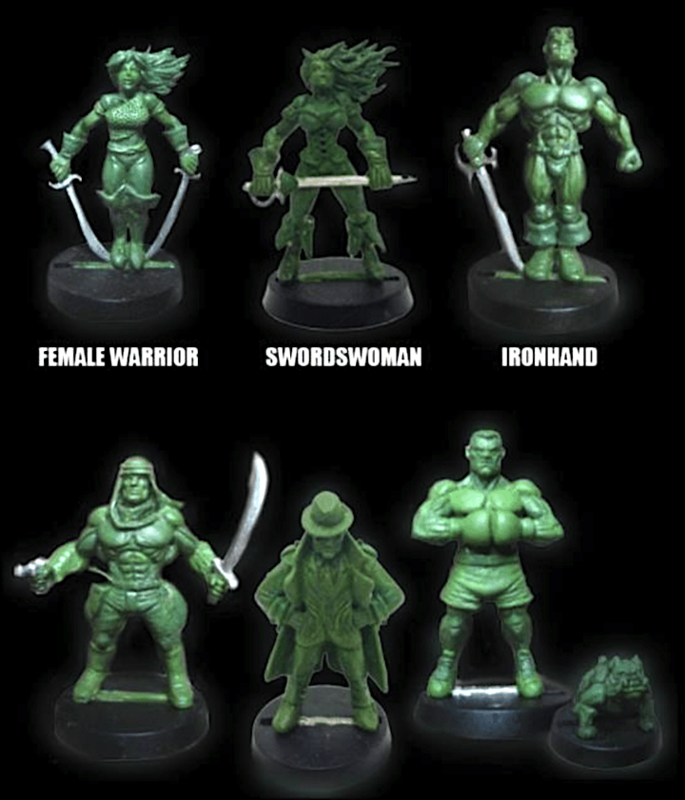 Ricardo Jove Sanchez’s mini-sculpt figurine was clearly modeled after Robert E. Howard’s iconic character and Frank Frazetta’s iconic paintings. Submitted as prima facie evidence in court, this screenshot of a Facebook post made under Sanchez’s pseudonym “Rykar Jové” provided the judge with a definitive and unmistakable side-by-side comparison. Click to enlarge. 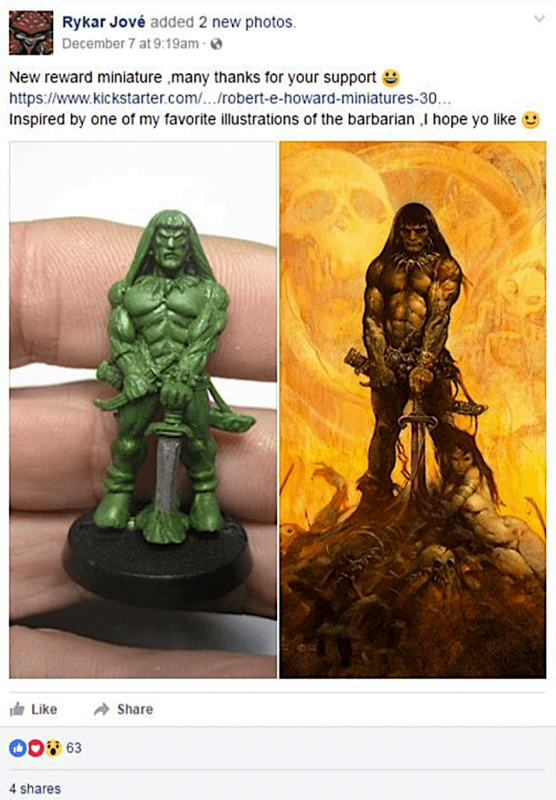 “A Spanish man has been ordered to cough up $21,000 for hawking unauthorized reproductions of action figures like Conan the Barbarian, Kull and El Borak over the internet. Brooklyn federal Judge Frederic Block found Ricardo Jove Sanchez liable under trademark infringement laws, saying he sold the collectibles despite knowing their likenesses were owned by Conan Properties International LLC, and Robert E. Howard Properties Inc. Sanchez peddled the figures of Conan, Kull, El Borak, Soloman Kane, Ironhand, Bran Mak Morn, and Dark Agnes over Facebook and Kickstarter for a three-year period, the companies alleged. Yet, when he was told to stop, the fraudster simply changed the names of his replicas and continued business as usual, according to Block. definition: a special honor or respect shown publicly. As most 1:6 scalers well know, a sort of character-infringement “light” has been going on at GIjOE shows around the world for a quite a long time now. This is not the work of major toy companies ripping each other off. No, this activity resides within the realm—and purview—of well-intentioned individuals. And it’s not a greed-driven pursuit, either. Quite the contrary, most of the time, any infringement being perpetrated is because of an individuals’ LOVE for a certain brand or character. His (or her) goal is RARELY to take money away from a brand’s rightful copyright holder(s). Rather, it is (they feel) their way of remembering, honoring, and/or THANKING the creators for something that has provided them with a lifetime of wonderful memories. But—however noble or sentimental their reasoning may be—those people are still—breaking the law. And that’s wrong. 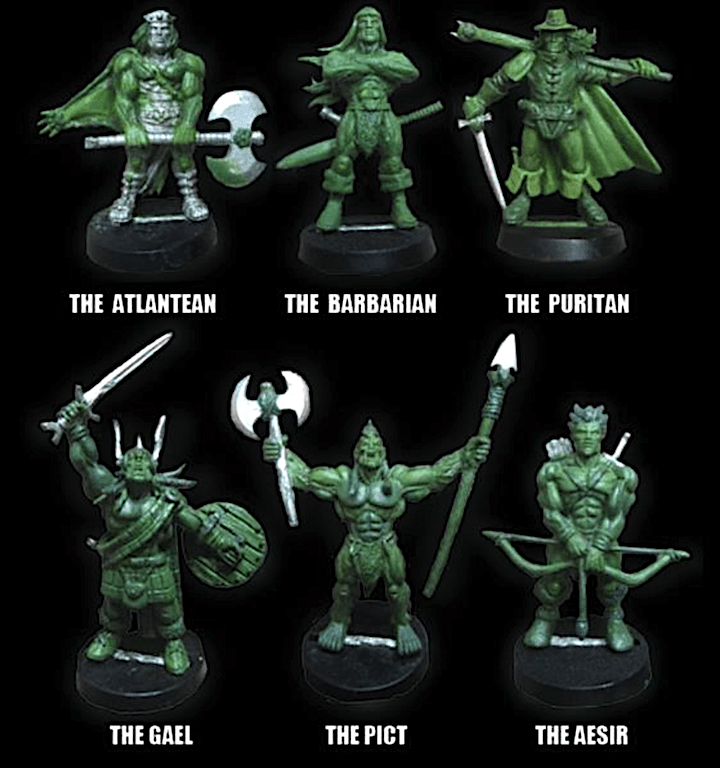 Too Close for Legal Comfort— With minor tweaks, these figures could’ve easily been declared completely original concepts, but then their sales would likely have dropped dramatically. Sanchez had received a warning about the trademarked names and replaced them with more generic ones (see above). Unfortunately, that wasn’t enough to satisfy the attorneys of Robert E. Howard, Inc. and a lawsuit was soon filed. Copyright laws exist to protect creators. (Photo: Ricardo Jove Sanchez) Click to enlarge. High Quality Honorifics— Sanchez’s work is superb. This pic shows six more of his sculpted (and unofficial) miniature creations. Remember, whenever you create an original work—it (and you) are BOTH protected by copyright law. (Photo: Ricardo Jove Sanchez) Click to enlarge. Bottom Line: Do YOU make your own “kitbashed” or custom action figures? Equipment? Packaging? Clothing? Are you aware of all of the legal pitfalls and potential financial penalties resulting from copyright infringement? Don’t get us wrong. You’re perfectly free to show off (and sell) all of your homemade creations with well-deserved pride. The First Amendment of the U.S. Constitution and U.S. copyright law protects you and ALL of your own unique artistic creations. BUT—if any of your work contains near (or exact) likenesses of any other copyrighted characters, logos, or well-known individuals (living or dead), then that MAY be a problem—especially if you ever decide to sell them publicly, online or in very large quantities. Any questions? We suggest you pay for an hour or so of time with your own, trusted attorney. That minor cost up front may save you a great deal MORE later on. View court documents from Sanchez’s case HERE.